I truly enjoy creating such treasures for families and hearing all the priceless stories brings tears to my eyes. I hope Julie’s story warms your heart as much as it has mine. 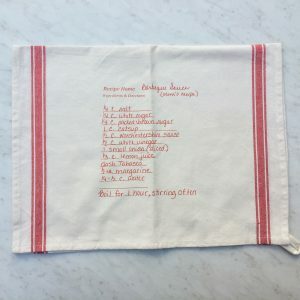 Who wrote the recipe you are having repurposed on an heirloom kitchen towel? I actually wrote it when I was about 8 years old while my Granny Ezelle (Dad’s Mom) told me the recipe from memory. 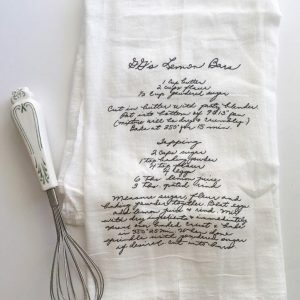 How far back does the recipe go? 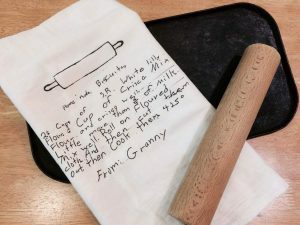 I’m actually not sure, but I know it was a different biscuit recipe than the one my granny’s mother used because Granny Goodman’s recipe used lard and was cooked on a flat iron skillet. These were instead rolled out, cut into rounds and baked in the oven. How often was this dish cooked? My dad is from a family of 5 children, so you can imagine feeding everyone had to be inexpensive and pretty straightforward. They had biscuits every morning for breakfast, always served with Golden Eagle table syrup and whatever breakfast meat she might have cooked up. I remember being taught how to mix the syrup with butter and dip my biscuit in it. Sorry, am I drooling?! Was it cooked for special events? The biscuits were more of an everyday staple, sort of like what a loaf of bread would be nowadays. Are the ingredients /brands still in use today? 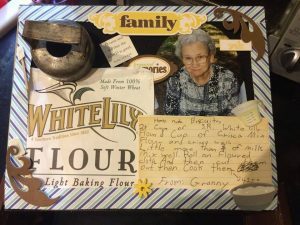 My granny only used White Lily self-rising flour and pretty much indoctrinated me as well. Lol! It does make a very light perfectly textured biscuit. She used pure white Crisco shortening, but I’ve subbed other fats over the years in a pinch. Crisco does indeed make the best biscuit texture though. She rolled them out on a floured cotton pillowcase that she reserved only for morning biscuits. Too many times to count. In fact, I’ve memorized it already. It’s not health food but when you need a quick biscuit for breakfast or a base dough for cinnamon rolls or faux scones, the ingredients are always there! I love grabbing a bite of the raw biscuit dough when I roll it out because it instantly takes me back thirty years! 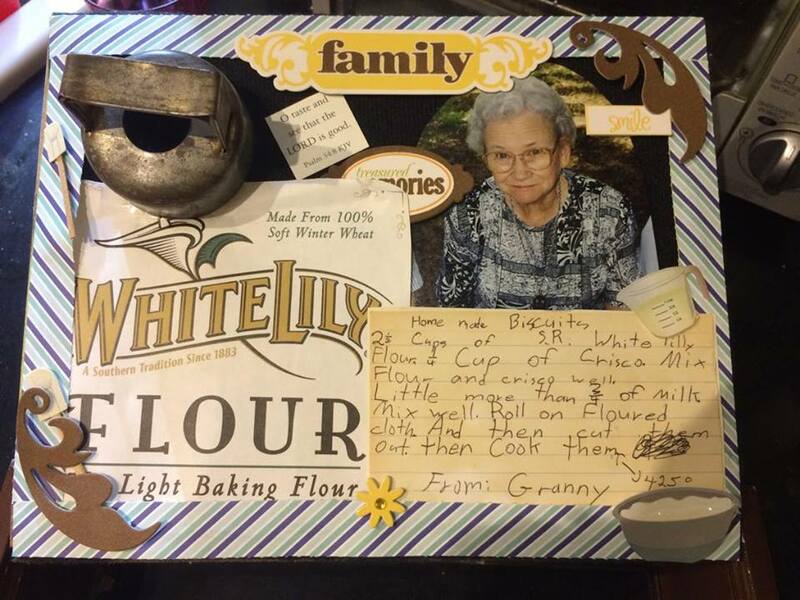 What’s your favorite memory of the loved one who wrote this recipe? Which memory isn’t a favorite, is more like it! I was able to spend a lot of good quality time with my Granny growing up. Granny and Granddaddy had nine grandkids and we always felt loved even though they didn’t have much money for things. We could grab a Coke and a Milky Way out of the fridge whenever we wanted. Swinging on her front porch swing and getting up early to bake with her were definitely my favorite times. She had the greenest thumb in the county and people from miles around knew about her famous ferns. People would borrow her ferns for weddings they were so lush and impressive. She was an amazing gardener. When she grew too old to cook much, for Christmas one year she gifted me her original biscuit cutter that she used every morning for decades. It brought me to tears because only God knows how many meals it had made and how many mouths it fed. 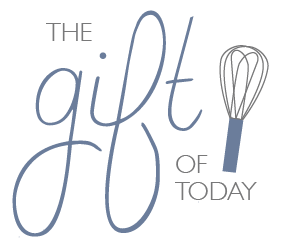 It is one of the most priceless gifts I ever received. 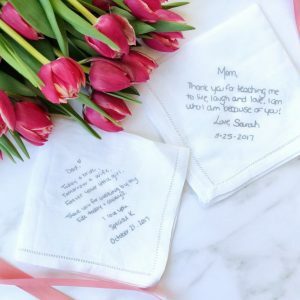 What’s the first thing you think of when you see the handwriting of your loved one? 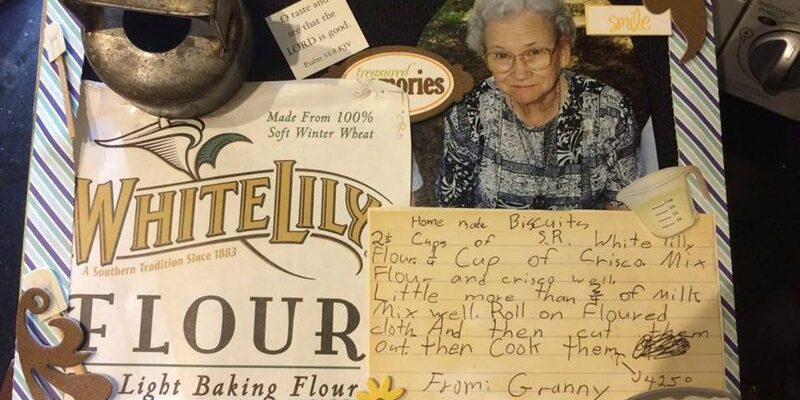 Well, this recipe was actually written by me when I was little while Granny was telling me the recipe from memory. So when I see my little girl handwriting, it takes me back to that day she first taught me to bake biscuits from scratch. 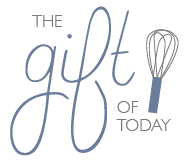 It was the first time I learned about cutting the fat into the flour with a pastry cutter. I think of her every time I do that now, no matter what I’m baking up. Anything else that’s special you’d like to share? I owe who I am today to the amazing women in my family. I am an avid baker now, some would say obsessive, due to the encouragement I received in the kitchen as a child. Food is a basic need and has such power to bring people together. Encouraging cooking with our children is such a simple, lasting tool and experience to be passed on and it benefits us our entire lives. And I’m forever grateful someone took the time to pass this love of baking on to me. My daughter has been helping me in the kitchen since the time she could see over the counter on a step stool, and at 6 years old now she gets excited every time I start whipping up a recipe because she knows she gets to help (and taste the dough of course)! Thank you for sharing, Julie Davis!! !